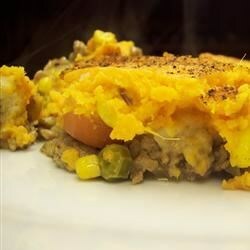 "This Thanksgiving-inspired version of Shepherd's Pie is wonderful year-round. Savory turkey is mixed with a touch of stuffing and a layer of vegetables, all topped with a fluffy and sweet potato mixture. Don't have time to make from scratch? Then simply substitute your turkey dinner leftovers! Chopped, cooked turkey and your homemade gravy can be substituted for the ground turkey mixture. Leftover vegetables greatly reduce prep time." Preheat oven to 375 degrees F (190 degrees C). Lightly grease a 2-quart, deep-dish casserole pan. Place the sweet potato, russet potato, and carrot each in separate saucepans. Pour enough water into each saucepan to cover the vegetables. Place each saucepan over medium heat and bring to a boil. Cook each until tender enough to pierce with a fork, 5 to 7 minutes; drain. Set the carrots aside. Place the drained sweet potato and russet potato in a large mixing bowl; mash lightly. Add the egg substitute and sour cream. Blend the potato mixture with an electric hand mixer set to medium until smooth and fluffy, about 2 minutes. Season with salt and pepper. Set aside. Heat the oil in a large skillet over medium heat. Cook the turkey in the hot oil until browned, 4 to 5 minutes. Add the onion, celery, garlic, 1 teaspoon thyme, and poultry seasoning. Cook until the turkey is cooked through and no longer pink. Increase the heat to medium-high. Pour the chicken stock into the turkey mixture. Whisk together the hot milk and flour until smooth. When the chicken stock begins to boil, add the flour mixture to the stock and stir until it thickens. Remove from heat and stir in Worcestershire sauce and browning sauce. Pour the turkey mixture into the bottom of the prepared casserole dish. Sprinkle the stuffing mix over the turkey mixture. Arrange the carrots, peas, and corn atop the stuffing mix. Season with thyme, salt and pepper. Spoon the potato mixture over the vegetables, spreading to cover all the way to the edges of the dish. Sprinkle with nutmeg. Bake in preheated oven until top is slightly browned, about 35 minutes. Allow to rest 30 minutes before serving. This was o.k....not great. I probably won't make it again.